In a medium sized sauce pan and over a medium heat, bring milk to a simmer. Stir in cacao powder and rice malt syrup. Remove from heat and let porridge sit for 2 minutes. This will help it thicken further. 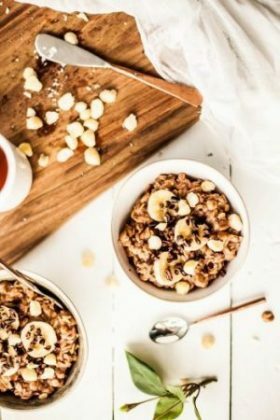 Serve in bowls topped with banana, sprinkled with cacao nibs and macadamia nuts.